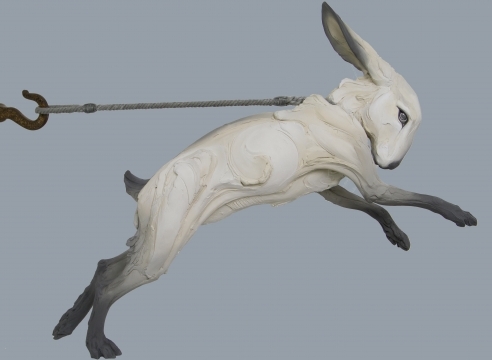 Jason Jacques Gallery presents The Other, its inaugural exhibition of work by Beth Cavener, one of the leading ceramic artists of our time. The opening reception with the artist is 6 to 9 p.m. on Wednesday, November 15, at 29 East 73rd Street. The show runs through December 5. Cavener, previously represented by Garth Clark – the highly influential curator, scholar and gallerist – has been working for several years on this highly anticipated exhibition, which crystallizes themes that she has been exploring throughout her career. The Other includes a selection of Cavener’s signature stoneware sculptures of ominous animals. The artist relies on animal body language as a metaphor for underlying patterns of human behavior. Cavener’s working process starts with the production of a clay base using metal armatures. She then breaks the base into sections, allowing her to work separately on each portion. She then reassembles the pieces before firing. Once fired, paint is thoughtfully added to the ceramic body. Born in Pasadena, California, in 1972, Beth Cavener received a bachelor’s degree in sculpture from Haverford College and a master of fine arts degree in ceramics from the Ohio State University. After a series of artist-in-residence programs in the United States, China, Italy and Japan, Cavener relocated to Helena, Montana, where she built a collaborative studio called Studio 740. Cavener has had several important solo and group exhibitions in the United States, Australia, and Taiwan, including Flow at the Milwaukee Art Museum (2014), Come Undone at the Claire Oliver Gallery (New York, 2012), Shifting Paradigms in Contemporary Ceramics at the Museum of Fine Arts, Houston (2012) and From the Ground Up: The 2007 Renwick Invitational at the Smithsonian Museum of American Art (Washington, D.C., 2007). Her work is in the collections of major art institutions, including the Metropolitan Museum of Art, the Museum of Art and Design (New York), the Smithsonian American Art Museum and the Museum of Fine Arts, Houston. She was awarded the Artist Trust Fellowship in 2009; the Jean Griffith Foundation Fellowship in 2006; the Virginia A. Groot Foundation Grant and an Individual Artist Fellowship from the Ohio Arts Council in 2005; and the American Craft Council’s Emerging Artist Fellowship in 2004.